White sand, the smell of Coppertone, fish tacos, yes. But mostly, margaritas. Don’t underestimate the amount of tequila a small woman can put away when it’s appropriately mixed with lime, salt, and a little bit of sunshine. On tropical vacations, I always feel like I’m in some weird Bermuda Triangle of alcohol tolerance where my upper limit for liquor is suddenly similar to that of like, a 250 lb. Irish biker dude that hangs out in bars and takes his coffee with two shots of Bailey’s. I shudder to think of what the cabana boys must think of my poor liver at that point in time, but what is that saying about “work hard, play hard?” Yeah, let’s do that. Our flight to Mexico last fall was to land mid-morning, giving us ample time to travel to our resort, check-in, and wiggle a pasty body into last summer’s bikini. By noon, I would be (over)due for a margarita. This is, at least, what was supposed to have happened. At 5pm the evening before our 5am flight to Mexico, my husband announced that he could not find his passport. We spent the next several hours plowing through stacks of papers, pulling sweaters off of shelves, looking through all of our luggage, bags, and purses, and even lifting up the coffee table for a peek. I looked between every book on my bookshelf, in the back of that weird, tiny cabinet that is above the refrigerator, and in the medicine drawer. Spoiler alert: we never found it. I can’t really articulate the things going through my mind at that point, nor would my thoughts at that time be appropriate to share on the Internet with you kind folks. You come here for recipes, not to read about the evil torture I was plotting for my husband. Although I was mega-bummed, my frustration and disbelief was outweighed by the look of devastation on Brett’s face. He works so hard for our family and he had earned every second of that vacation. We were both equally disappointed and discouraged. Eventually, we decided to throw in the towel and I called to cancel our flight. I spent the next hour on the phone with the airline and I think we can all agree there is nothing worse than that. Forty minutes of automated conversation with a smattering of elevator music, all endured in hopes of finally talking to a REAL PERSON?? And then, can you even be sure it’s a real person? I’m convinced they’ve hired robots, which would actually be impressive if some scientist has already figured out how to create machines that are even more annoying that any human being I’ve ever met. I submit that a superior option to these world-dominating telephone robots would be Siri or even Scarlet Johannson from that movie “Her”. Or maybe they could hire Matthew McConaughey or Morgan Freeman to do the voice prompts? These have got to be better ideas than what we’re currently working with. I was moments away from a mental break when Brett announced we still just needed to get away. We had airline credit now, a babysitter lined up for the weekend, and a few days off work; we might as well spend those days on the road to somewhere else instead of sitting at home, salivating over the margaritas that should have been. The following day, we were poolside in Scottsdale, Arizona, which I’m now pretty sure is is the birthplace of cactuses (cacti?) and delicious, over the top breakfast and brunch options. The trip was perfectly splendid, but I was definitely missing my margarita. When we got home, I made a margarita for Brett and a cocktail for myself that was almost too good for words. I was really proud of this creation until just recently when I discovered it was not ingenious and, in fact, was a near dead-ringer for Mexico’s most popular cocktail: the Paloma. Have you all tried one of these? 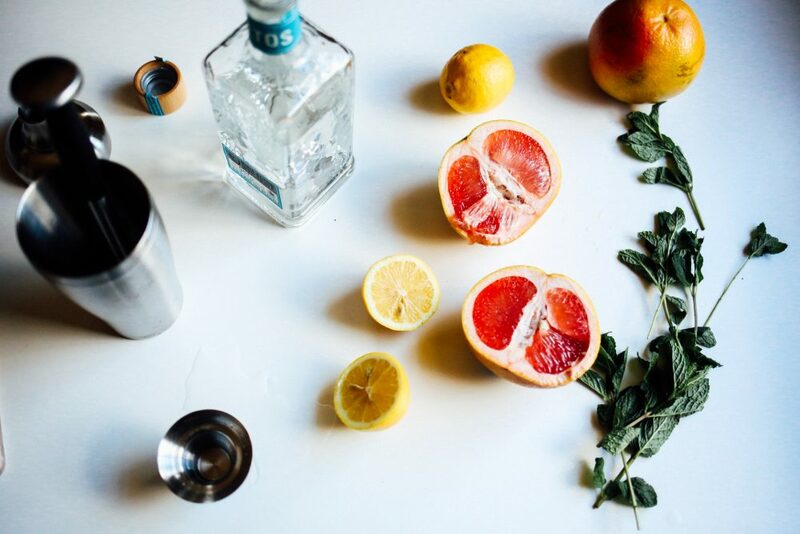 If my research serves me well, a traditional Paloma consists of tequila with a splash of grapefruit soda and a wedge of lime. In light of a margarita, I have unknowingly turned a blind eye to this delicious beverage for years! No longer. 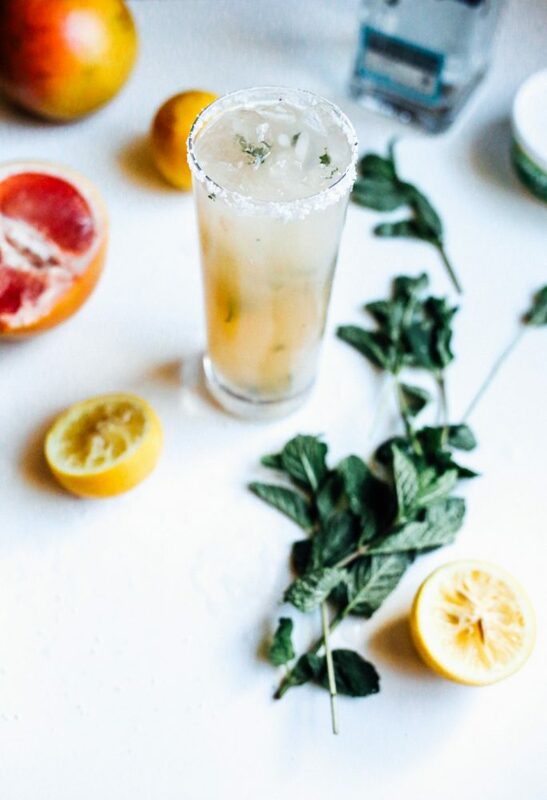 The version I mix up for myself contains fresh grapefruit and lemon juice, tequila, simple syrup, and a few mint leaves muddled in for good measure. I told Brett they were called Grapefruit Tejitos because in my mind, I was drinking a flavored mojito made with tequila instead of rum. 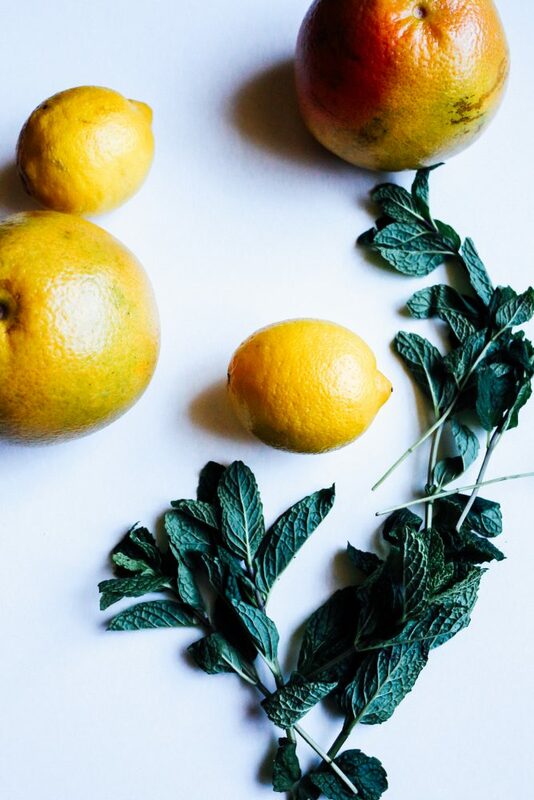 These cocktails are refreshing, tart, and multi-faceted in flavor. With a salt-rimmed glass, they make me feel like we never missed that flight to Mexico last fall and we’re laying on the beach right at this very moment. Sigh. Maybe this fall. I think these tejitos (it has a ring to it, doesn’t it?) would be a perfectly unique way to celebrate Cinco de Mayo in a couple weeks, or, at the very least, to celebrate the start of this weekend. Give them a try and let me know what you think! 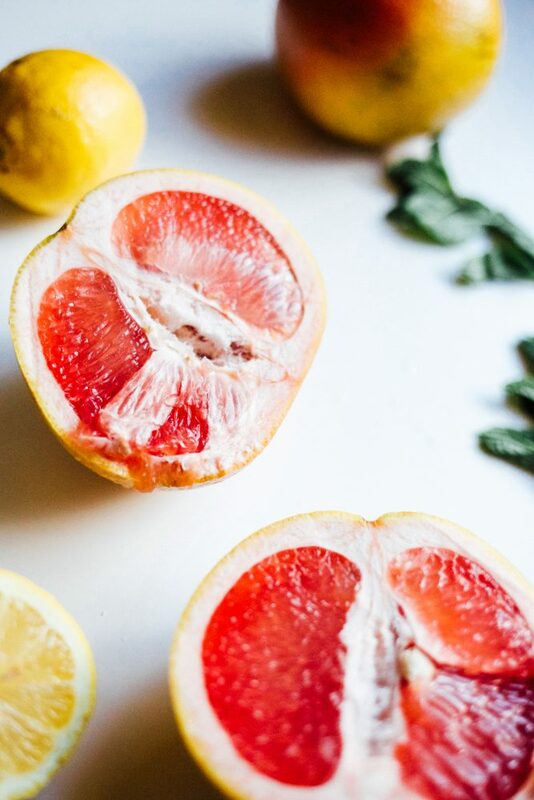 If a mojito had a love triangle with a grapefruit and some tequila, these grapefruit tejitos would be the outcome. This beverage is refreshingly balanced in flavor, offering both sweet, tart, and floral notes. Muddle mint in the bottom of a martini shaker. Add tequila, Cointreau, simple syrup, and fruit juice. Fill shaker up with ice and shake vigorously for at least 30 seconds or until ice has begun to dissolve. Serve in a salt rimmed glass with additional ice, if desired. You had me at tequila. What a saga — but glad you got this delicious cocktail out of it. Need to stock the bar with some cointreau, and then this cocktail is a must!